Chomsky’s business works something like this. He gives speeches on college campuses around the country at $12,000 a pop, often dozens of times a year. Can’t go and hear him in person? No problem: you can go online and download clips from earlier speeches—for a fee. 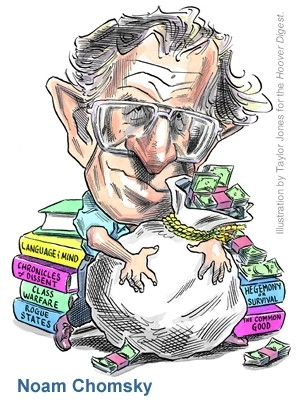 You can hear Chomsky talk for one minute about “Property Rights”; it will cost you 79 cents. You can also buy a CD with clips from previous speeches for $12.99. Chomsky’s marketing efforts shortly after September 11 give new meaning to the term war profiteer. In the days after the tragedy, he raised his speaking fee from $9,000 to $12,000 because he was suddenly in greater demand. He also cashed in by producing another instant book. Seven Stories Press, a small publisher, pulled together interviews conducted via e-mail that Chomsky gave in the three weeks following the attack on the Twin Towers and rushed the book to press. His controversial views were hot, particularly overseas. By early December 2001, the pushlisher had sold the foreign rights in 19 different languages. The book made the best-seller list in the United States, Canada, Germany, India, Italy, Japan, and New Zealand. It is safe to assume that he netted hundreds of thousands of dollars from this book alone. Protectionism is a bad thing—especially when it relates to other people. But when it comes to Chomsky’s own published work, this advocate of open intellectual property suddenly becomes very selfish. It would not be advisable to download the audio from one of his speeches without paying the fee, warns his record company, Alternative Tentacles. (Did Andrei Sakharov have a licensing agreement with a record company?) And when it comes to his articles, you’d better keep your hands off. Go to the official Noam Chomsky website (www.chomsky.info) and the warning is clear: “Material on this site is copyrighted by Noam Chomsky and/or Noam Chomsky and his collaborators. No material on this site may be reprinted or posted on other web sites without written permission.” However, the website does give you the opportunity to “sublicense” the material if you are interested. Radicals used to think of their ideas as weapons; Chomsky sees them as a licensing opportunity. Chomsky has even gone the extra mile to protect the copyright to some of his material by transferring ownership to his children. Profits from those works will thus be taxed at his children’s lower rate. He also extends the length of time that the family is able to hold onto the copyright and protect his intellectual assets. In October 2002, radicals gathered in Philadelphia for a benefit entitled “Noam Chomsky: Media and Democracy.” Sponsored by the Greater Philadelphia Democratic Left, for a fee of $15 you could attend the speech and hear the great man ruminate on the evils of capitalism. For another $35, you could attend a post-talk reception and he would speak directly with you. During the speech, Chomsky told the assembled crowd, “A democracy requires a free, independent, and inquiring media.” After the speech, Deborah Bolling, a writer for the lefty Philadelphia City Paper, tried to get an interview with Chomsky. She was turned away. To talk to Chomsky, she was told, this “free, independent, and inquiring” reporter needed to pay $35 to get into the private reception. But a funny thing happened on the way to the retirement portfolio. When I asked Chomsky about his investment portfolio he reverted to a “what else can I do?” defense: “Should I live in a cabin in Montana?” he asked. It was a clever rhetorical dodge. Chomsky was declaring that there is simply no way to avoid getting involved in the stock market short of complete withdrawal from the capitalist system. He certainly knows better. 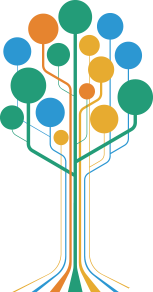 There are many alternative funds these days that allow you to invest your money in “green” or “socially responsible” enterprises. They just don’t yield the maximum available return. This essay is adapted from the author’s new book Do As I Say (Not As I Do): Profiles in Liberal Hypocrisy (Doubleday, 2005). Available from the Hoover Press is The Fall of the Berlin Wall, edited by Peter Schweizer. To order, call 800.935.2882 or visit www.hooverpress.org.